Eden's second birthday is very quickly approaching. Last year, I embraced my sadness, and I was able to mourn and celebrate my daughter in the days leading up to and on her birthday, but this year I feel like I've tried not to think about it, and I have realized that I've been avoiding my own feelings about it, because things are different this year. Last year I was pregnant. I was around 15 weeks or so along, and I was mostly assured that we were expecting a healthy baby, but I don't think the reality that we'd have a baby in the end kicked in until much later. This year I have that healthy baby. She's a beautiful, and wonderful 6 month old who gives me so much joy that I feel like my heart will burst when I look at her. She fits into our family so perfectly that I can't imagine a life without her in it, but I know that if Eden had been healthy, we probably wouldn't have our little Rosalie, and that reality tears at my emotions. Eden is a Big Sister! I should have posted an update about Rosalie sooner, I know this, and I apologize to those who've been wondering about us. Thank you to the people who have reached out asking for an update! The reason for the delay is I've been struggling with how exactly to announce Rosalie's birth on this blog, because I know that many of my readers (especially new readers who come across our blog) are moms or dads who've recently been given a diagnosis of anencephaly or other fatal birth defect in their precious child. I want to be sensitive to that, and not have the first post they see on my blog to be this huge birth announcement announcing a healthy baby when they are expecting to find a story similar to their own. At the same time though, I want to give hope to those parents. Because there is hope - I was so afraid of never having another healthy baby after we lost Eden, but our precious rainbow baby was born absolutely perfect and is completely healthy. She is truly a blessing. I can't believe it's Christmas Eve again already. The year has absolutely flown by, and while I'm excited for tomorrow morning when Brooklyn comes down our stairs to open Christmas gifts, and excited to head over to my parents' house to spend time with family, I miss Eden in a special way tonight. It's kind of crazy to think she would have been over a year old for this Christmas, and she would have absolutely loved to play with all the wrapping paper and be surrounded by family. I know she's in Heaven right now, rejoicing for the one Gift that truly matters in this world, but that still doesn't make me wish any less that she were here to celebrate Christmas with her family. As the holidays approach, times are busy. This past week has been pretty busy too. I am 17 weeks pregnant now, and should be having my 20 week ultrasound very soon. It will be great to get confirmation that this baby is completely healthy and growing well, and I think I'll be able to enjoy the rest of the pregnancy more knowing that. I do know for certain the baby I'm carrying right now definitely does not have anencephaly. I had a quick ultrasound the other day to get baby's heart rate, check the placenta's location (anterior, and far from my scar!! Good news! ), and to just peek at baby's head. 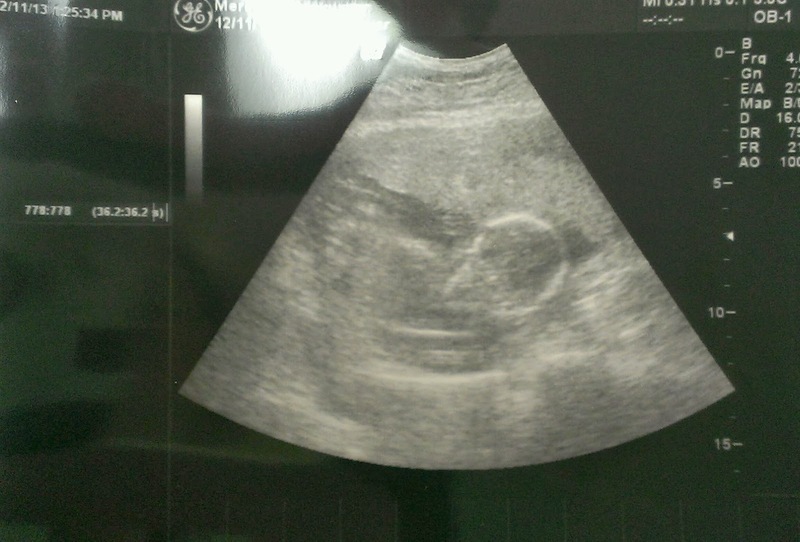 I saw a beautifully round head on the ultrasound, and any fears I had about anencephaly are gone. 17 weeks, with a beautiful round head! Today is October 15th, Pregnancy and Infant Loss Remembrance Day. Eden's been on my mind a lot lately anyway, because of my current pregnancy, but we are getting closer to her first birthday, and so I've been thinking about her more and more. I've also been thinking about my Mema a lot lately. We are only a few days away from her being gone an entire year...it doesn't seem possible. I miss them both so much, and I can only take comfort in the fact that Mema is up in Heaven holding my baby girl for me. Thing had been seeming very down lately. James had lost his job a couple months ago, bills were piling up, and it seemed like my body wasn't planning on regulating itself anytime soon, but last week suddenly everything changed. A couple weeks ago James found an ad for a job online and submitted his resume. Within minutes he got a call for a same-day interview! The interview went great and then we waited. After not hearing back for several days, James called the company back, and they had him come in for a meeting with the owner of the company - the next day he was working his new job for more than his old job paid and closer to home than his old job! Praise God!